The 640’s primary structure is aluminium alloy extrusions or sheel, with the ribs, frames, extrusions, stringers, rigid hinges, reinforcements and skin panels all sharing the structural load. The wing is a single piece main spar with no sweep, with two fuel tanks. 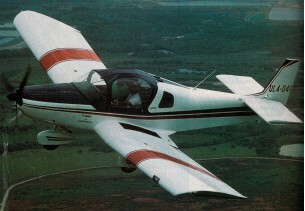 The fuselage is a semi-monocoque with steel firewall, and fibreglass fairings and cowl. The fixed, tricycle undercarriage employs bungee-cord shock absorbers, and 5.00x5 tyres.